Capri is part of the Western edge of a wide Bahamian-type Mesozoic carbonate platform known as the Campania-Lucania platform and has been a celebrated beauty and resort spot since the time of the Roman Republic. Capri started occupying an important role in the political and military matters of the Roman Empire when Ottaviano landed here in 29 BC and was struck by the incredible beauty of the island. This lead him to take it from Naples, in exchange for Ischia. 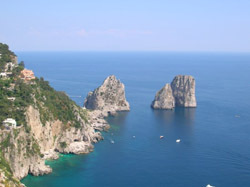 It wasn’t until the eighteen hundreds that the name “Capri” became known to the rest of the world. Initially it owed its fame to its strategic position for the control of Southern Italy and as the territory of bitter fighting between the French of Napoleon’s Empire, who had succeeded the Bourbons, and the British. Capri’s fame increased much later, with the growing interest in travel, which brought the island the first of a long stream of foreign visitors. Capri became a place where to dedicate oneself to ”otium” and the art of hospitality, allowing its visitors to take in the beauty of its surroundings in complete tranquillity. The fortune of Capri’s industry has been in it’s ability to welcome, with the same care and discretion, guests of every social extraction. Many influential people chose to vacation in Capri because they were drawn by its exquisite beauty and were seduced by the hospitable spirit of the islanders. Even today you can find big name celebrities in the very heart of this magnificent Island. The traditions in a town are a great way to understand the history of the population which resides there, and on the island of Capri you can find a number of religious yearly festivities. These feature such festivals as the performing of mass, prayer and processions to the more glitz and glamour of festivals with the yearly film festival. From the spring through to the autumn, the circulation of non residents’ cars, motorbikes is strictly forbidden. Vehicles should be left in the car parks close to the ports of embarkation or in a nearby garage. The only exemptions made is for those vehicles with foreign number plates, driven by the owner. The island of Capri is well served by an efficient public transport system, which links all of the areas accessible by road. It is worth remembering that much of the island is dedicated to pedestrian areas. The central “Piazzetta” of Capri, though preserving its modest village architecture, is lined with luxury boutiques, expensive restaurants all of which make you feel ike a modern day celebrity. Whether searching for the latest designer outfit, an exclusive piece of jewellery or just a souvenir to take home, the narrow streets and hidden alleyways of Capri are full of unique and original products. The visitor is able to experience and acquire the best of both Italian and local products. There are many bars and restaurants whose tables spill out onto the walkways and piazzas, which are perfect to sit down and simply watch the world go by. Capri is an Island surrounded by beauty, elegance, history and views that can never be truly appreciated on a postcard. The only way to truly capture the beauty of Capri is to see its for yourself..